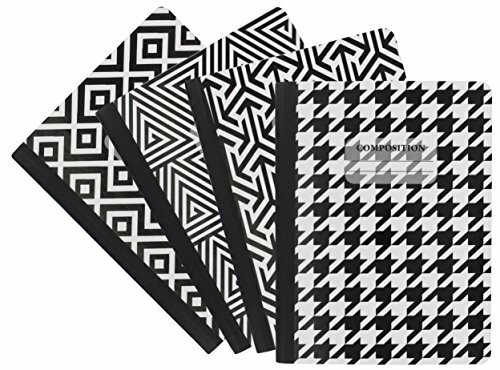 About The Emraw Black & White 4 Fashion Styles Cover Classic Composition Book 4-Pack. The Emraw Black & White 4 Fashion Styles Cover Composition Book where you can write in everything in a nice order without losing anything. The pages are securely bound to a smooth spine that will not snag on clothes or backpacks, ensuring a long-lasting value. The front has a class schedule to keep you on track, and the back cover has multiplication tables, conversion tables for quick reference. You can write your name & phone number in the name box on the cover to avoid losing it. Kids can personalize the front and back cover with a collage of pictures, stickers, photos to tell about themselves/project's. ✓ The Emraw Black & White 4 Fashion Styles Cover Composition Book is ready for any assignment and is used by students for formal and creative writings and journaling. ✓ SPECS: The length size is 9-3/4" and the width is 7-1/4" and its suitable for all types of pens and pencils and fits in the purse or carry bag nicely without being too heavy. ✓ QUALITY: The wide-ruled sheets give you plenty of space for writing and they're permanently sewn to the binding so your work stays in place - The cover is sturdy and protects the sheets and holds up over the course of the school year and beyond. ✓ DESIGN: Class Program Schedule on inside of the front cover, Conversion Table and Multiplication Table on inside of the back cover which is tailored to today's busy students - Durable marble design with room for name on front cover with secure sewn binding and stitched-in sheets keeps the 100 sheets of wide ruled white paper (200 pages) clean, dry and protected. ✓ USES: Useful to Record your thoughts the moment they occur, wherever you are. You can cross them out, forget them and find them again - Great for writing/sketching in class, home, office on the train or for Science/Social study works. Teachers like it because you can't rip out a page without the teacher knowing, so this way the teacher can see all your work.